Slow down brake system for Dolomite Melody and Soprano model walkers. Safety feature prevents the walker from rolling away. 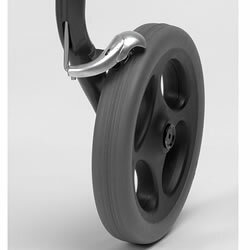 Helps the user control speeds downhill and compensates for a weak side, keeping walker running in a straight line through individual tension control knob settings for each wheel. Slow down brake works independent from regular braking system. Perfect for gait training and one-handed solutions. One slow down brake, order left or right.